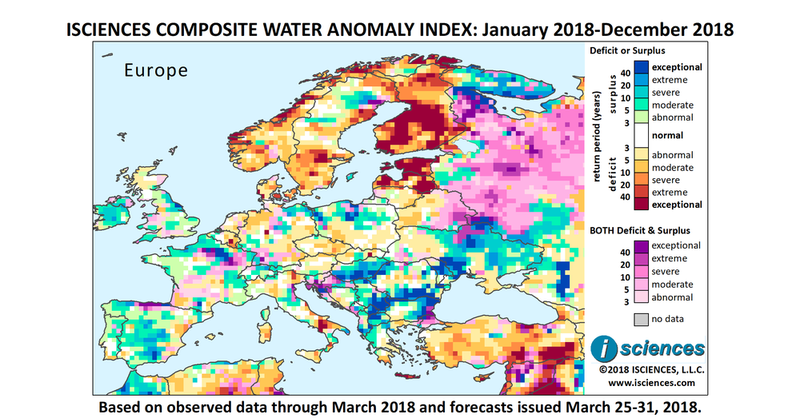 The 12-month forecast ending December 2018 indicates exceptional water deficits in Finland, Estonia, Latvia, Crete, and a band across southern Italy south of Naples. Deficits of varying severity, including some intense deficits, are expected in Norway and southern Sweden. Pockets of moderate deficit are forecast for Central Europe. Surpluses are forecast for Eastern Europe, pockets in the Balkans, Ireland and the southern UK, much of the Iberian Peninsula, northern France, and northern Poland. Surpluses will be intense in Hungary, Moldova, southern Romania, southern Serbia, Kosovo, Macedonia, and the Marne River Basin in France. Conditions of both deficit and surplus are forecast for European Russia. 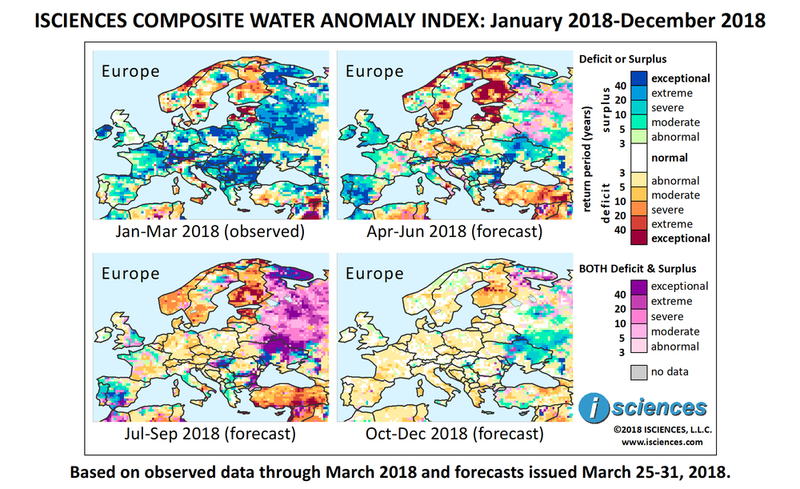 Notable in the April through June forecast is the retreat of water surplus in Central Europe and a transition to moderate deficit conditions. Deficits in Northern Europe are expected to increase, with exceptional deficits forecast for Finland, Estonia, and Latvia, and severe to exceptional deficits persisting in coastal Norway and increasing in southern Sweden. Surpluses are expected to persist in parts of Eastern Europe and the Balkans, remaining intense in Hungary, southern Romania, Moldova, and eastern Bulgaria, and increasing in extent in Ukraine. Surpluses will continue to emerge in Ireland, Northern Ireland, and Wales; will emerge throughout England; and will expand on the Iberian Peninsula, upgrading to exceptional from Granada, Spain north to Toledo and west into Portugal. Central France will transition away from surplus to moderate deficit, as will southern Greece. Intense deficits will persist in a band across southern Italy south of Naples, and in Crete. Widespread surplus in European Russia will diminish. After June, mild deficits are forecast for Central Europe, moderate to exceptional deficits continue in Northern Europe, and conditions of both deficit and surplus in northern Ukraine and European Russia as the region transitions. Intense surpluses will continue to emerge in eastern Hungary, central Moldova, and south-central and northeastern Ukraine. Surpluses will diminish considerably in the UK. On the Iberian Peninsula, surpluses will continue to emerge in the west but some areas in the south will begin to transition. The forecast for the remaining months – October through December 2018 – indicates mild deficit in much of the region, moderate deficit in Finland, and surplus from northern Ukraine into Russia. More than 15,000 growers flocked to Madrid in early March to urge the Spanish government to develop solutions to frequent water shortages affecting Spanish agriculture. Protestors handed out 2,500 tonnes of free fruit and vegetables to call attention to their concerns and called on the government to increase infrastructure for irrigation and desalinization. Heavy rain and snow coupled with rapid thaws have caused flooding across Europe with the Balkans and Eastern Europe being particularly hard hit. Albania, Bulgaria, Croatia, Serbia, Hungary, Montenegro and Romania have all experienced flooding over the past month. The IFRC released an Emergency Plan of Action for Belarus, where 3,000 people were affected as of the end of March with over 50,000 people at-risk with expected spring flooding. The city of Okhtyrka in Ukraine’s Sumy region was turned into a second Venice as water control structures failed due to a rapid spring. Gas and electricity was turned off in the affected area and 400 homes were inundated, with emergency evacuations occurring in the dead of night. A bypass around the city had to be destroyed to allow flood waters to recede. The IFRC released a further warning in late-March that conditions may get worse as extreme weather was forecast putting thousands at risk. Record flooding in 2013 has lead the German village of Fischerdorf to improve flood prevention infrastructure. Located at the confluence of the Danube and Isar Rivers, what was once manageable flooding turned into a disaster in 2013 as heavy rainfall overwhelmed a dam and water pumps, submerging the town. Recently completed improvement include a second, higher dike and a newly engineered floodplain designed to handle comparable events as well as more severe ones expected with global warming. The project is part of a €3.4 billion (US $4.2 billion) investment by federal and Bavarian authorities to protect districts along the Danube. A different concern from flooding has arisen in the strife-torn Donbas region of eastern Ukraine. A radiation catastrophe may be in the making as staff at the Yuncom coal mine, 40km (25mi) northeast of Donetsk, informed an OSCE monitoring mission that water pumps at the mine may be turned off, allowing the mine to flood. In 1979 under the Soviet Union, a low-yield nuclear device was exploded in the mine to release a buildup of gasses. Mine engineers did not know how flooding might impact the radiation containment vessel but there are concerns that soil and groundwater could be contaminated with radiation. A recent study out of Newcastle University evaluates 571 European cities, projecting they will see increased drought as well as flood risk as climate change progresses. The study finds that droughts will be more prevalent in Southern Europe and up to 14 times more severe, while increased risks from river flooding will be experienced in northwest Europe with a greater than 50 percent increase in 10-year-high river flow events. The study includes a list of Top 100 cities with hazards across the continent.